Active bond managers could use more of Bill Gross’s swagger. That messy last act refers to Gross’s stint as manager of the Janus Henderson Global Unconstrained Bond Fund since 2014. Gross made some big bets at Janus Henderson that didn’t pay off, most famously a wager last year that rates on U.S. Treasuries and German bunds would converge, resulting in sagging performance for his unconstrained bond fund. Even though Gross’s calls didn’t turn out the way he and his investors had hoped, Gross was right to bet boldly on his best ideas, and active bond managers would be wise to follow his example. 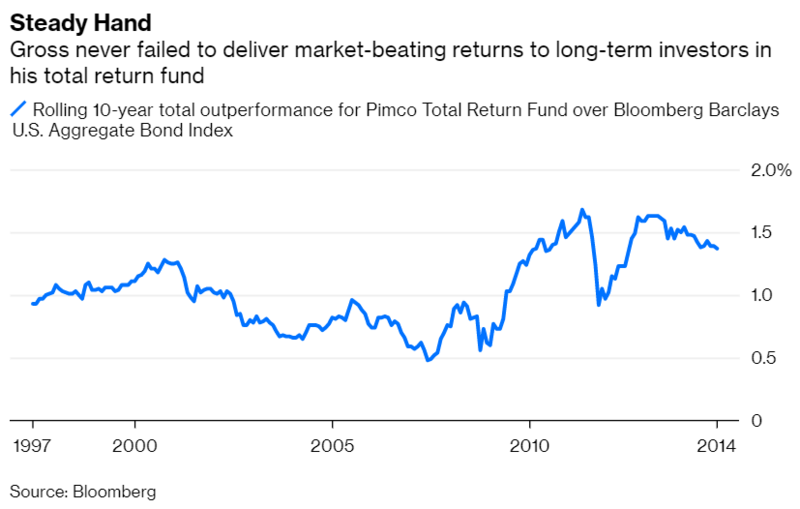 The pivot to unconstrained investing was a brave departure for Gross, who had spent the previous three decades perfecting the “total return” approach to bond investing with the Pimco Total Return Fund he founded in 1987. 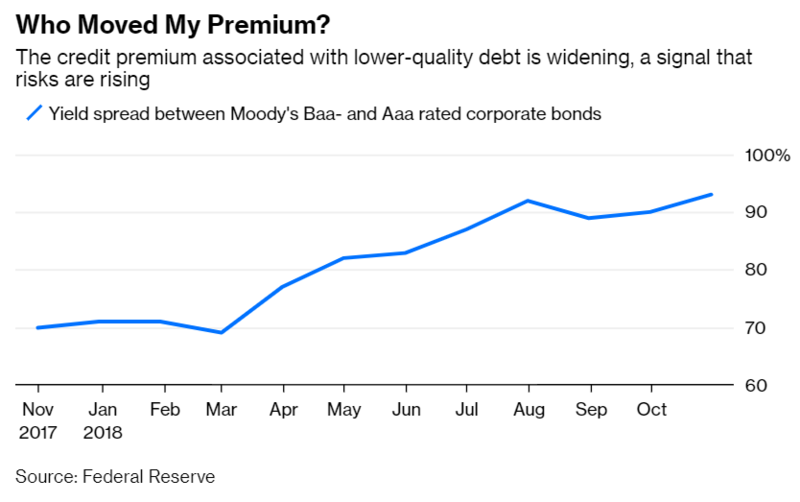 The strategy attempts to outpace the broad bond market by taking modestly more risk, often by buying lower-quality bonds than are reflected in broad-market bond indexes while targeting a similar average maturity. No one did it better than the Bond King. The institutional share class of Gross’s total return fund outpaced the broad bond market, as represented by the Bloomberg Barclays U.S. Aggregate Bond Index, by 1 percentage point annually during his run from June 1987 to September 2014, a huge margin for a bond manager. And he did it with only modestly more risk, as measured by annualized standard deviation (4.3 percent for Gross’s fund compared with 3.9 percent for the index). Stock pickers are striking back. Jeffrey Vinik, who rose to fame as manager of the Fidelity Magellan Fund in the 1990s, told CNBC last week that he was getting back into the stock-picking game. He will resurrect Vinik Asset Management, a hedge fund he closed in 2013. Only this time, Vinik won’t just be competing with the market and other managers. He will also have to outmaneuver the computers that are increasingly displacing stock pickers. It’s a brave move. Stock pickers have struggled to perform in recent years and investors are abandoning them. 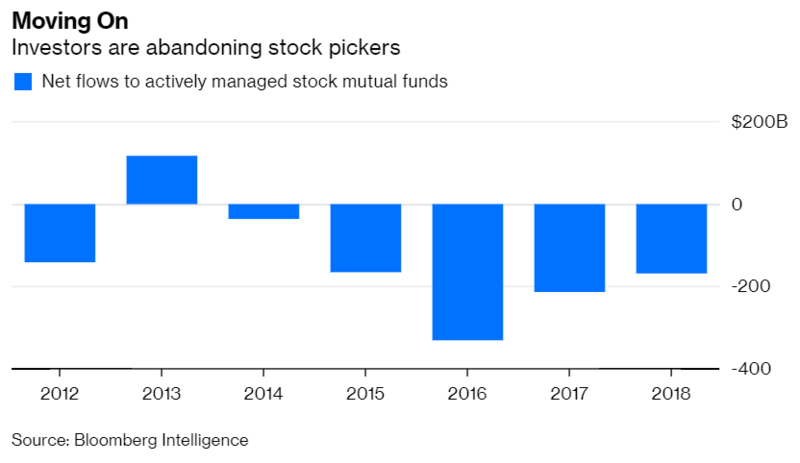 Actively managed stock mutual funds have experienced net outflows for five consecutive years, a total of $918 billion from 2014 to 2018, according to estimates compiled by Bloomberg Intelligence. Hedge funds managed to hang on to their assets for most of that period, but after a disappointing 2018, investors are pulling money from them, too. It’s fashionable to blame a bad environment for stock picking for active managers’ woes, but it’s not entirely true. 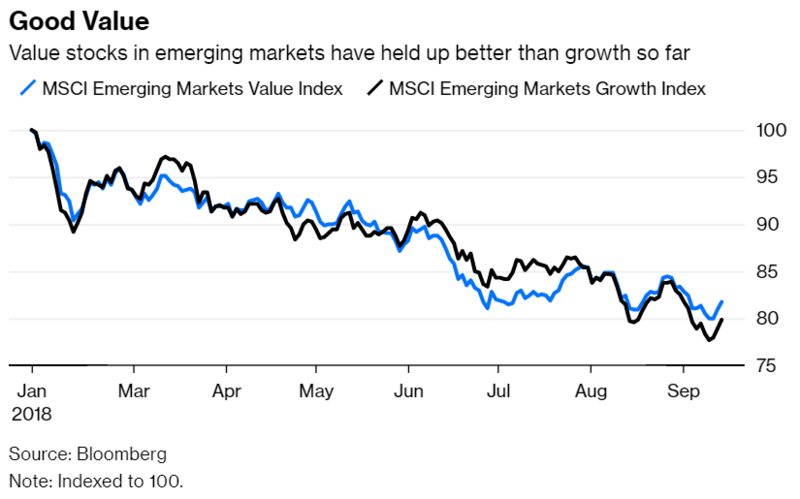 Sure, value investing has lagged the broad market over the last decade, but other styles of active management, such as growth, quality, momentum and low volatility, have beaten the market. In other words, active managers have underperformed, not active management. Investors in U.S. growth stocks have been richly rewarded in recent years, but their fortunes are set to turn if President Donald Trump can’t resolve his trade disputes. Bloomberg News reported on Wednesday that China and the U.S. had wrapped up three days of trade talks and “expressed optimism that progress had been made.” For Trump, that’s a clear departure from his usual tough talk on trade. That shouldn’t be surprising. As I pointed out recently, the president fancies himself a champion of American business and gauges his success by the level of the stock market. The market’s steep drop in December signaledthat the country’s biggest companies, which dominate market barometers such as the Dow Jones Industrial Average and the S&P 500 Index, are under increasing stress. They generate much of their revenue overseas, so Trump’s trade disputes are an obvious concern. If the president was hesitant to connect those dots, Kevin Hassett, chairman of the White House Council of Economic Advisers, was not. He told CNN last week that “There are a heck of a lot of U.S. companies that have sales in China that are going to be watching their earnings being downgraded next year until we get a deal with China.” That was a day after Apple Inc. cut its revenue outlook, blaming in part weaker demand in China. But Trump’s trade policies don’t affect all companies equally. Growth companies, or those that are expected to grow faster than average, sell more of their products overseas than slower-growth value companies. That means they have more to gain from free trade and, of course, more to lose during a trade war. Lu Zhang, a finance professor at Ohio State University, has something to say about your hot new index funds, and it may not be flattering. Not long ago, the typical investment portfolio was a grab bag of stocks, bonds and actively managed mutual funds. Today, it is more likely an assortment of index funds. And not just any index funds. Indexes are no longer content to simply track the market. 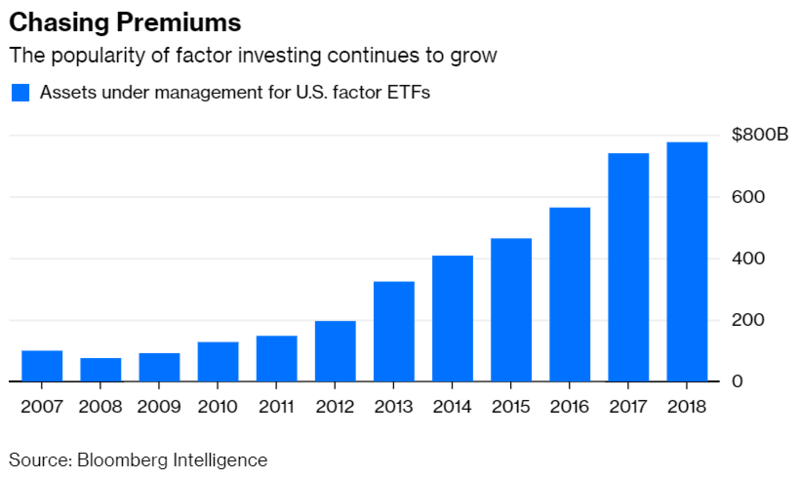 A growing number of them are attempting to replicate traditional styles of active management, also known as “factors.” I counted roughly 900 mutual funds and exchange-traded funds in the U.S. that track factor indexes, and that number is likely to grow. The pivot to indexing may be new, but it was cultivated by decades of research in economics and finance, which gives it the imprimatur of science, or at least robust inquiry. But a new generation of academics, Zhang prominently among them, are re-examining the research and finding much of it questionable. Their work could derail the indexing revolution and, as might be expected, index providers and fund companies aren’t likely to be happy about it. The U.S. stock market notched yet another record on Wednesday, and many investors are anxiously looking for signs of a slowdown. The concern is likely to interest more than just wary investors. Factor investing is increasingly popular. 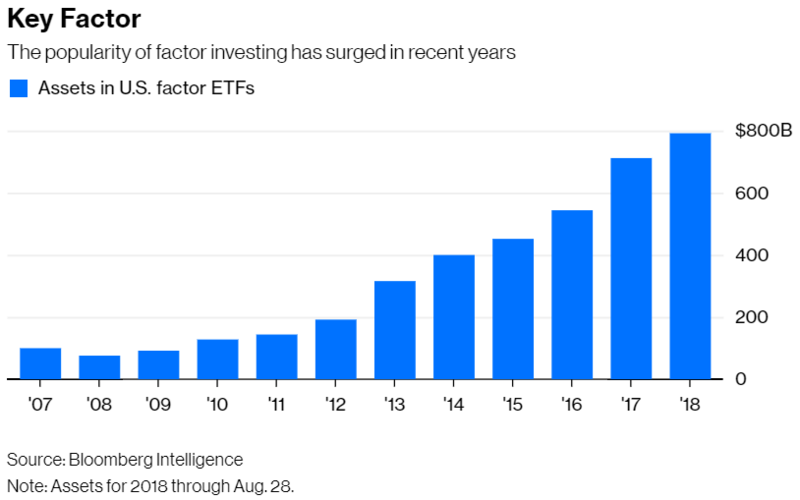 Investors have poured $352 billion into value, momentum, quality and other factor exchange-traded funds since 2013, according to Bloomberg Intelligence, nearly double the $191 billion in factor ETFs at the end of 2012. I can’t open a web browser lately without seeing a banner promoting State Street Corp.’s new digital series “Crazy Enough to Work” starring actress Elizabeth Banks — who, I must confess, I think is fabulous. The series profiles four midsize companies. The first two episodes showcase EPR Properties and the New York Times Co. and have already been released. The final two feature Dunkin’ Brands Group Inc. and the Boston Beer Co. and will be available on Aug. 29 and Sept. 12, respectively. It’s all a plug for State Street’s SPDR S&P MidCap 400 ETF, which makes me wonder about those algorithms supposedly customizing my online experience. I’ve never expressed any interest in buying a mid-cap stock fund. It’s not that I have anything against mid-caps. On the contrary, I own them like nearly everyone else. I’m defining mid-caps as stocks with a market value of $1 billion to $10 billion. If you own a large-cap stock fund, chances are you own some mid-caps, too. 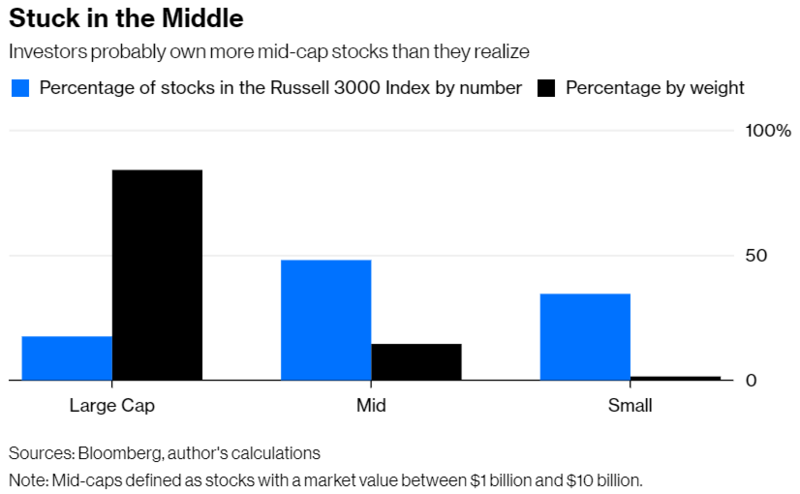 Consider that there are 458 mid-cap stocks in the Russell 1000 Index, which collectively make up 8.9 percent of the index. Mid-caps make up an even bigger chunk of the broader market. There are 1,429 mid-caps in the Russell 3000 Index, accounting for 14.6 percent of the index. It’s time for FAANG stocks to break up, at least in investors’ minds. Facebook, Apple, Amazon, Netflix and Google parent Alphabet can’t get away from one another. Every time one grabs the spotlight — as Apple did last week when it became the first U.S. company with a $1 trillion market value — it brings along the other four. They’re alternately hailed as the hot stocks, technology’s brightest lights and indispensable growth companies, and jeered as a worrisome sign of a frothy and top-heavy market. But look closely and it’s no longer clear why they should be lumped together at all. Let’s start with the technology moniker. Amazon is a retailer and Netflix is an entertainment company, which is why, contrary to popular perception, the Global Industry Classification Standard, or GICS, tags them as consumer discretionary companies, not tech. And as of the next GICS reclassification in September, Facebook will move from the tech sector to telecommunications, where it belongs. Only two of the five FAANGs, in other words, are true technology companies.